Situated in a beautiful part of the East Neuk of Fife within a few minutes of the picturesque seaside Royal burgh of Elie and Earlsferry. For all guests, the boarding cattery offers panoramic views of open countryside hosting a large variety of wildlife and all the comings and goings of the countryside. 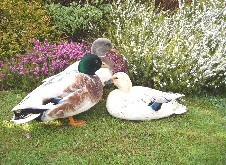 Closer to the cattery our very own resident Call Ducks... Marigold and Parsley plus the poultry along with our small herd of pedigree dairy goats going out to their paddock during warm days. There is always something to watch throughout the day. Leaving your beloved cat/s and being assured they will be given the best possible attention in a homely caring enviroment makes it less sressfull. As its only a barding cattery with no kennels its also very peacful. Working in and around the cattery throughout the day the guests will never feel lonely or abandoned. atmosphere giving guests and owners all the assurance of a high standard of care whilst enjoying a tranquil stress free holiday. Hi I'm Ben, I was very fortunate to be found by Elaine when I was abandoned in a log pile when only 5wks old but survived thanks to Elaine and her mum, I have had a Purr-fect home second to none here at Easter Grange for 16years. I'm more often than not around to welcome feline guests weather permitting of course. 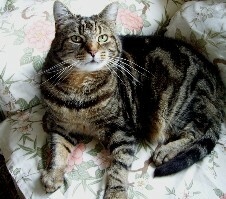 In 2010 Ben brought home a feline friend, another handsome tabby who decided to stay and they became the best of friends from day one, a heartbreaking day when Ben was put to sleep at 19 years old three years ago. Billy immediately took over Bens role welcoming everyone on arrival, he's the most affectionate cat ever and loves all the attention your almost guranteed to meet him! 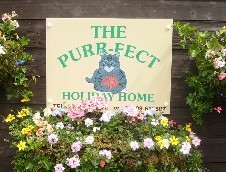 When you come to stay at The Purr-fect Holiday Home, Elaine will give you her dedicated care as she has done to all the guests since the boarding cattery opened in 2000. Viewings are welcome, please call to arrange a visit.